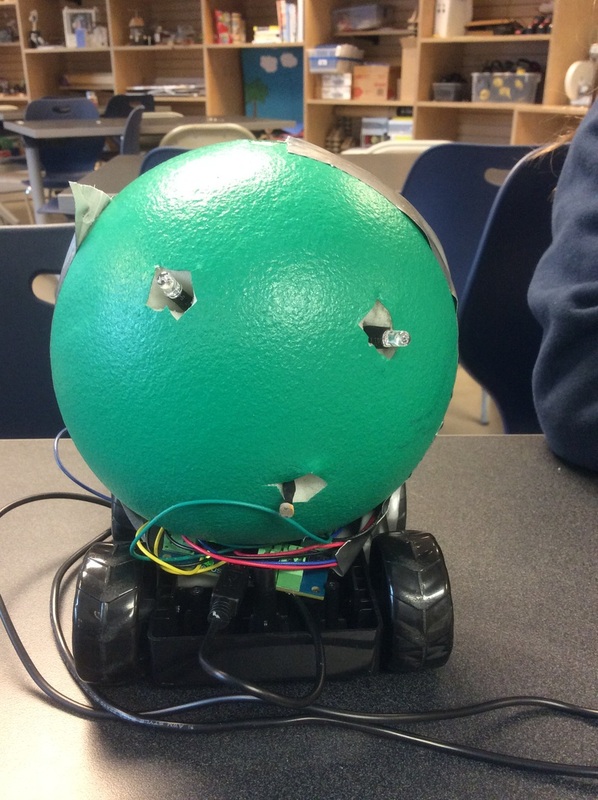 Project Description: This project is a robot on four wheels with a head made of a ball and LED eyes. Materials: We used a ball from the P.E. department, a hummingbird, wires, two LED's, the base of a car that has four wheels, a motor, and in order to activate it a computer is needed. 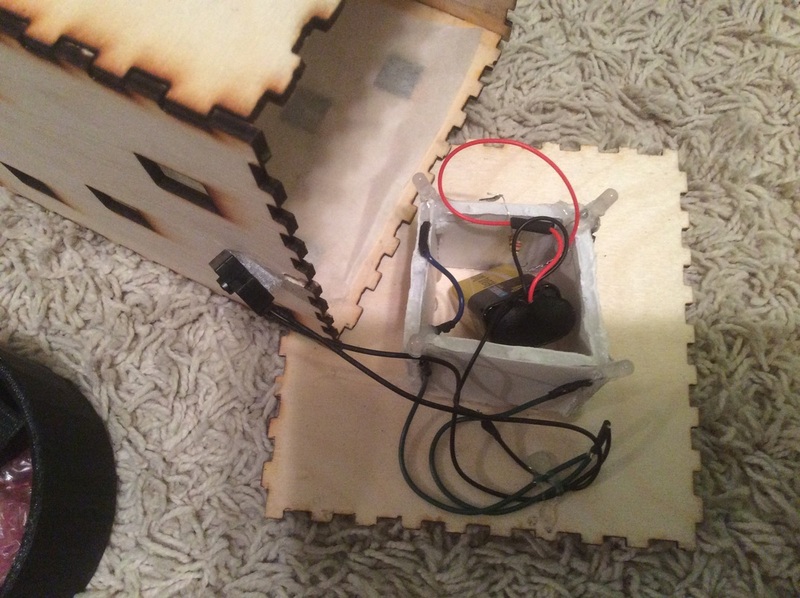 Tools: In our project we used a soldering iron, a hot glue gun, and wire cutters. What was the most challenging part of the project? : The most challenging part of the project was getting the car to move. Were there times when things didn’t work as you expected? : Something that didn't go as expected was when the wheels did not move. What did you do to resolve the problems you ran into? 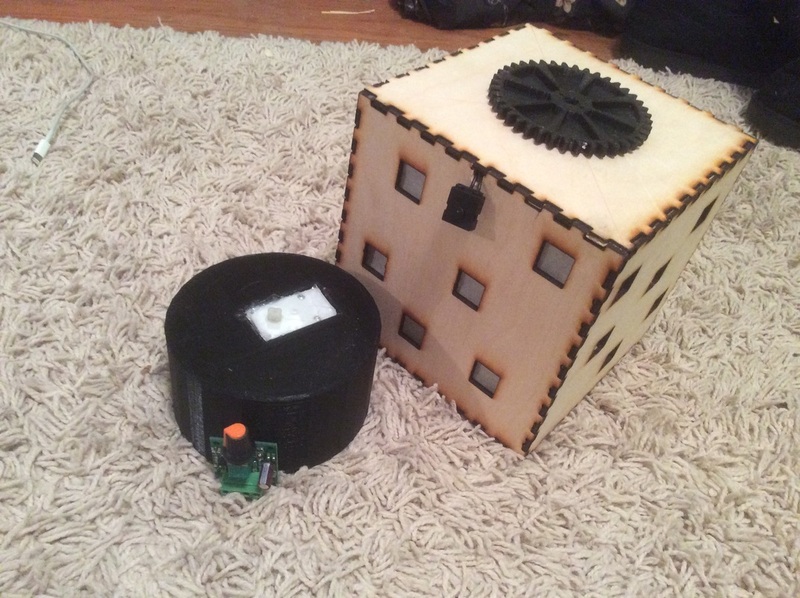 : To resolve this problem we took off our body of the robot. What was the most fun? : The thing I found the most fun was getting to work with Elsa and Ella. What did you learn by going through this process? : During this process I learned how to use a hummingbird. Were there new tools you had to learn about in order to complete the project? : I already knew how to use all the tools for this project. In your attempts to make things work, did you find yourself trying new strategies or approaches? 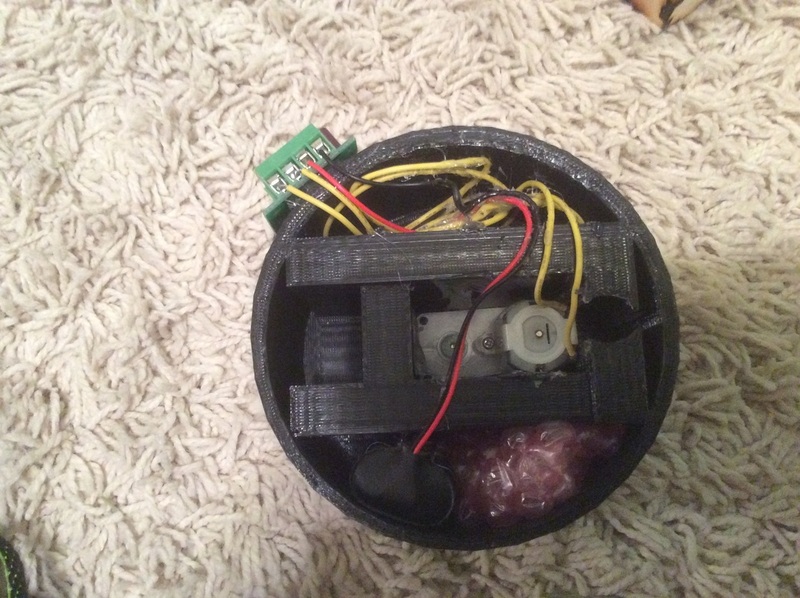 : In order to get our robot to work we had to take off the body of our robot and place its head onto the wheel platform so that it would move. What would you change? : If you had the time and resources, what would you change about your project if given the opportunity? 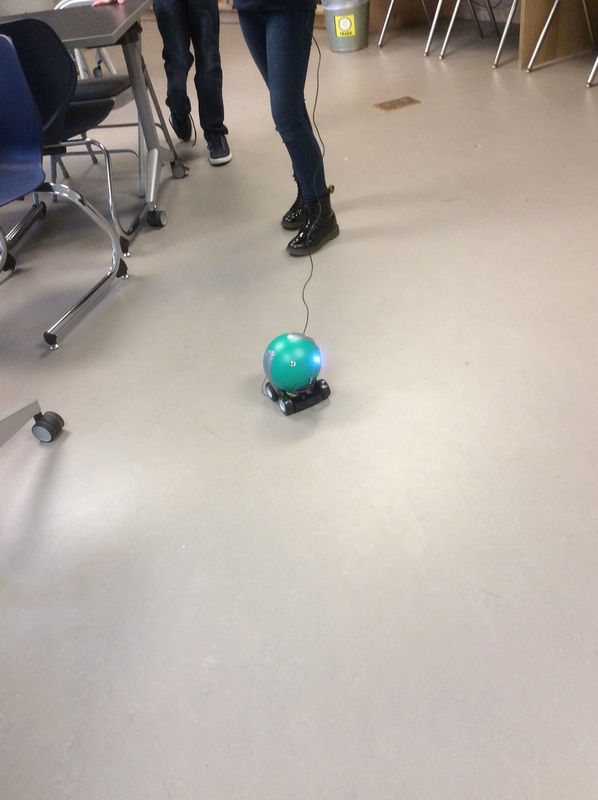 : If we had the time my group would have tried to make our robot stop and turn when it sensed an object in front of it. Project Description: My project looks like a jumping fish. Materials: The materials I used were orange construction paper, an iPhone box, foam board, and a wooden skewer. Tools: In my project I used a hot glue gun, scissors, and an eyelet crimped. What was the most challenging part of the project? : The most challenging part of the project was making my machine run smoothly because it kept getting stuck. Were there times when things didn’t work as you expected? : Something that didn't go as expected was the size of my fish. What did you do to resolve the problems you ran into? : To resolve this problem I attempted again, but this time I made sure the fish was larger. What was the most fun? : The thing I found the most fun was designing my fish. What did you learn by going through this process? : During this process I learned that it is important to not glue things until you know they work correctly. In your attempts to make things work, did you find yourself trying new strategies or approaches? : Everything ran fairly as expected, but I did have to reshape some of the foam board wheels to make my project run smoothly. What would you change? : If you had the time and resources, what would you change about your project if given the opportunity? : I don't think I would change anything about my project because I am very satisfied with the way it turned out. 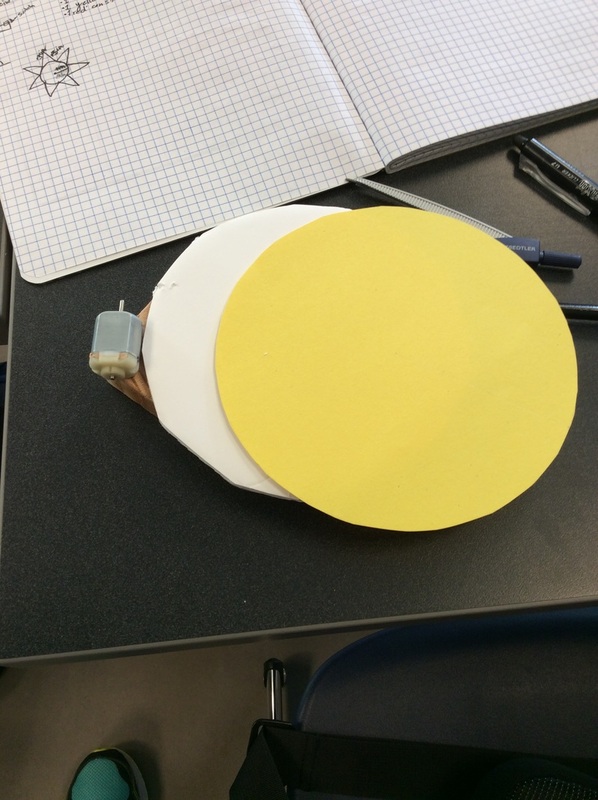 Project Description: My project resembles a spinning sun. 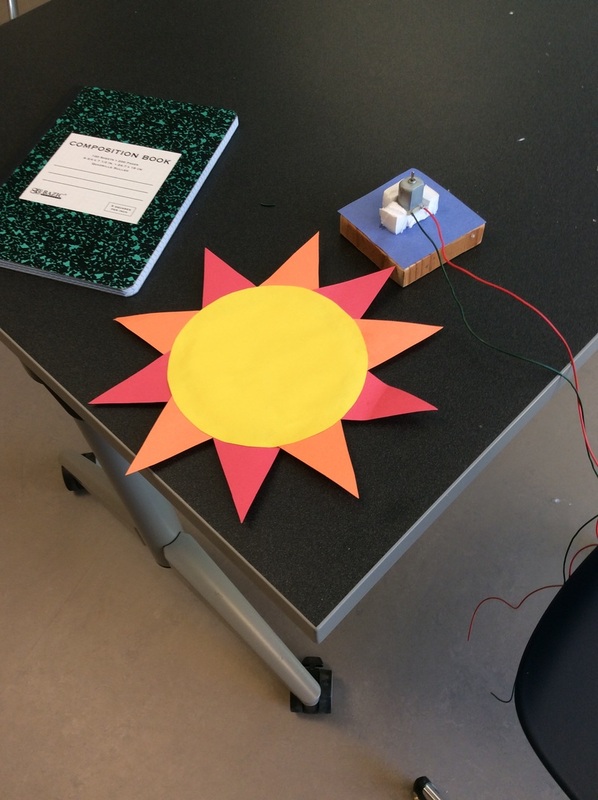 Materials: The materials I used were a wood block, a motor, a switch, one blue piece of construction paper, one piece of orange construction paper, one piece of yellow construction paper, foam board, and multiple wires. Tools: In my project I used wire cutters, an exacto knife, a ruler, a compass, a hot glue gun, and a soldering iron. What was the most challenging part of the project? : The most challenging part of the project was soldering. Were there times when things didn’t work as you expected? : Something that didn't go as expected was the amount of time it took me to complete the project. What did you do to resolve the problems you ran into? : The way I resolved the problems I ran into was by asking teachers and friends for help. What was the most fun? : The thing I found the most fun was watching the final project work. Were there new tools you had to learn about in order to complete the project? : In order to complete this project I had to learn how to use a soldering iron. In your attempts to make things work, did you find yourself trying new strategies or approaches? 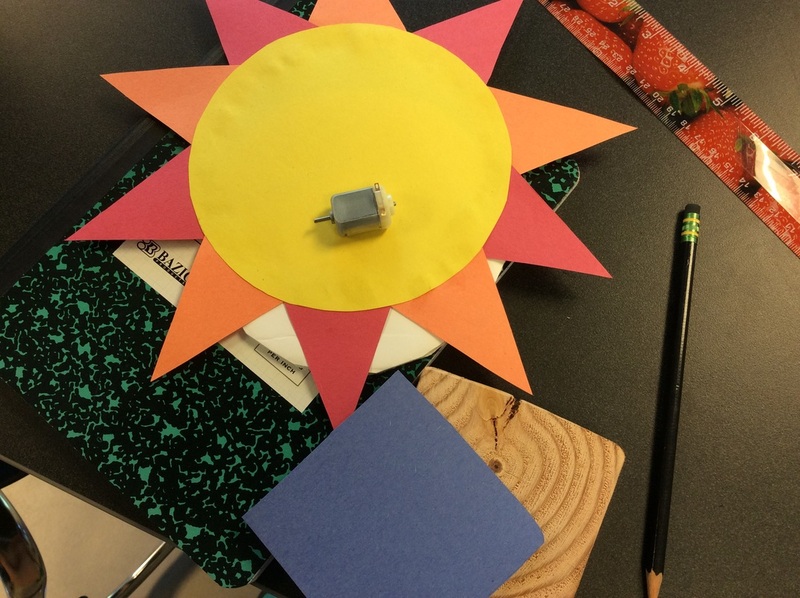 : I found that as I continued to work on my project I changed the size of the sun and the position of the wires. What would you change? : If you had the time and resources, what would you change about your project if given the opportunity? : I would find a way to make the sun more stable if I had more time.